IsoRight is simple to use online Quality Management Software that requires no installation, little training and delivers results. As a complete quality management system on the internet, IsoRight contains all the features required by your organisation to track and manage quality in near real-time on a daily basis. ​​IsoRight is a simple to use online quality management system that requires no installation and little training. Simply fire up a browser, register and start capturing your processes, documents and jobs. You will find planning and tracking the quality standards in your business easier then ever before. IsoRight is designed by experts with decades of experience in manufacturing and service delivery and most especially in ascertaining quality. Our features and data content templates are directly targetted at ISO requirements. Each element is carefully designed to ensure that you can reach your goal of certifiable quality management. Whether you are in the field on a service call, on the floor at a process station or in the admin office, data is easy to enter and gives the whole business a realistic view on what is happening on the ground. 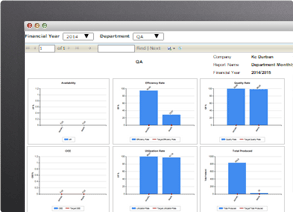 In most organisations, quality data is captured late and frequently incorrectly into spreadsheets. This leads to manual and delayed reporting. IsoRight encourages you to capture your quality data directly and therefore reporting is available immediately. Data can be captured on a desktop, phone or tablet on the floor. You can perform quick and simple analysis of where you stand in terms of quality, as well as where it is trending to. 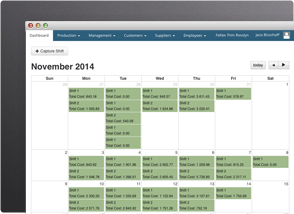 This helps pick up problems earlier and lets you find and compare efficiencies on your lines or in your service teams. 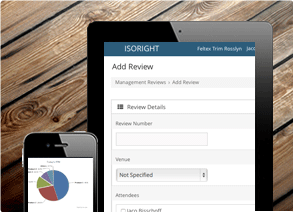 There are multiple ways to review what is happening in your quality in IsoRight. There is the dashboard that is the starting point for every time you login. There are slew of reports in the reporting module. And there is comprehensive tabular data summarised on the production capture and review screens. Isoright © Copyright 2019. All rights reserved. Designed on the East Coast.